Just as writers have ink and paper, code plays an analogous role in a developers' "story". Programming is storytelling. As with all stories, there are drafts and revisions, parts that are easier to write than others, and just like with your favorite novel, a few small changes can make a huge impact on the ending. 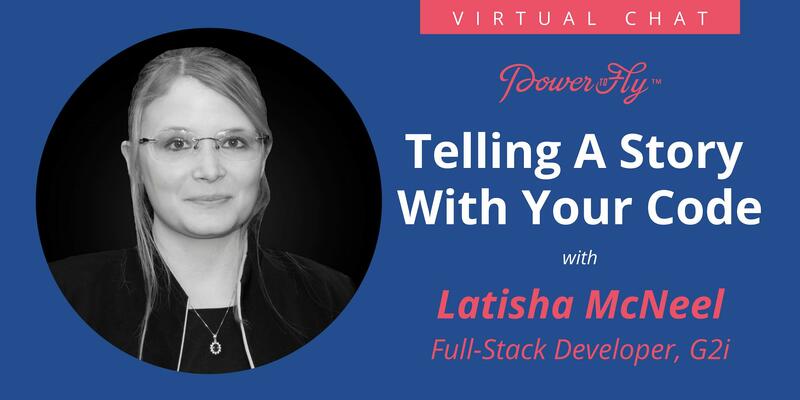 Latisha McNeel, a Full-Stack Developer at G2i is joining us for an hour of live Q&A; to answer your questions about how you can develop your own story through code. During this chat, you'll also have the opportunity to learn all about the open roles at G2i, tips for your application, and what they are looking for in their next hire! Can you give us an example of using code to tell a story? How can I improve my storytelling? What's the biggest roadblock you've faced as a developer? Latisha McNeel is a Full-Stack Developer with a focus on front-end and user experience. In addition to her full-time coding job, she teaches the Full-Stack Flex Coding Bootcamp at the University of Texas at Austin in Houston. She has two cats and enjoys hiking, with plans to complete her first thru-hike later this year. Career pivots are becoming the norm thanks to bootcamps and a plethora of online resources. It's safe to say that pivoting into a career in engineering isn't as challenging as it once was - but still a pretty daunting task! Anjali Merchant and Hannah Barton are both career pivoters who've found a home at Polis, a company that's reinventing how people communicate. Ask Anjali and Hannah anything about becoming engineers in this live chat - and find out more about the company they call home! You asked, they're answering: What did you do before working at Polis? Which route did you take to become engineers? What advice do you have for other pivoters looking to start a career in Engineering? Is Polis hiring? & more! MEET THE SPEAKERS: Anjali Merchant Anjali graduated with a B.A. from Middlebury College and M.S. from Yale University. After working as a technology consultant, Anjali studied full-stack software engineering at the Grace Hopper Program, an all women programming school. She is currently a software engineer at Polis. Hannah Barton Hannah received her bachelor’s degree in Philosophy with a minor in Physics at Brandeis University. After working in sales at a large organic food company for several years, she attended Grace Hopper and switched careers into software development. She works as a software engineer at Polis.